Vertical axis: millions of years ago. The Jurassic period (/dʒʊəˈræsɪk/; from Jura Mountains) was a geologic period and system that spanned 56 million years from the end of the Triassic Period 201.3 million years ago (Mya) to the beginning of the Cretaceous Period 145 Mya. 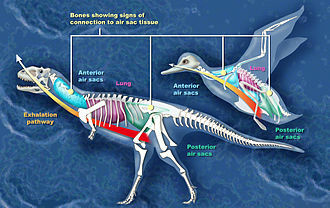 [note 1] The Jurassic constitutes the middle period of the Mesozoic Era, also known as the Age of Reptiles. The start of the period was marked by the major Triassic–Jurassic extinction event. Two other extinction events occurred during the period: the Pliensbachian-Toarcian extinction in the Early Jurassic, and the Tithonian event at the end; however, neither event ranks among the "Big Five" mass extinctions. The Jurassic is named after the Jura Mountains within the European Alps, where limestone strata from the period were first identified. By the beginning of the Jurassic, the supercontinent Pangaea had begun rifting into two landmasses: Laurasia to the north, and Gondwana to the south. This created more coastlines and shifted the continental climate from dry to humid, and many of the arid deserts of the Triassic were replaced by lush rainforests. The chronostratigraphic term "Jurassic" is directly linked to the Jura Mountains, a mountain range mainly following the course of the France–Switzerland border. During a tour of the region in 1795, Alexander von Humboldt recognized the mainly limestone dominated mountain range of the Jura Mountains as a separate formation that had not been included in the established stratigraphic system defined by Abraham Gottlob Werner, and he named it "Jura-Kalkstein" ('Jura limestone') in 1799. 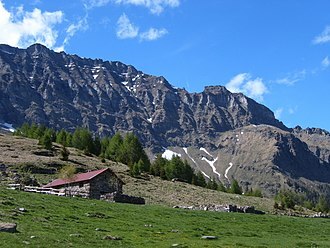 The name "Jura" is derived from the Celtic root *jor via Gaulish *iuris "wooded mountain", which, borrowed into Latin as a place name, evolved into Juria and finally Jura. During the early Jurassic period, the supercontinent Pangaea broke up into the northern supercontinent Laurasia and the southern supercontinent Gondwana; the Gulf of Mexico opened in the new rift between North America and what is now Mexico's Yucatan Peninsula. The Jurassic North Atlantic Ocean was relatively narrow, while the South Atlantic did not open until the following Cretaceous period, when Gondwana itself rifted apart. The Tethys Sea closed, and the Neotethys basin appeared. Climates were warm, with no evidence of a glacier having appeared. As in the Triassic, there was apparently no land over either pole, and no extensive ice caps existed. The Jurassic geological record is good in western Europe, where extensive marine sequences indicate a time when much of that future landmass was submerged under shallow tropical seas; famous locales include the Jurassic Coast World Heritage Site in southern England and the renowned late Jurassic lagerstätten of Holzmaden and Solnhofen in Germany. In contrast, the North American Jurassic record is the poorest of the Mesozoic, with few outcrops at the surface. Though the epicontinental Sundance Sea left marine deposits in parts of the northern plains of the United States and Canada during the late Jurassic, most exposed sediments from this period are continental, such as the alluvial deposits of the Morrison Formation. The Jurassic was a time of calcite sea geochemistry in which low-magnesium calcite was the primary inorganic marine precipitate of calcium carbonate. Carbonate hardgrounds were thus very common, along with calcitic ooids, calcitic cements, and invertebrate faunas with dominantly calcitic skeletons (Stanley and Hardie, 1998, 1999). The first of several massive batholiths were emplaced in the northern American cordillera beginning in the mid-Jurassic, marking the Nevadan orogeny. Important Jurassic exposures are also found in Russia, India, South America, Japan, Australasia and the United Kingdom. In Africa, Early Jurassic strata are distributed in a similar fashion to Late Triassic beds, with more common outcrops in the south and less common fossil beds which are predominated by tracks to the north. As the Jurassic proceeded, larger and more iconic groups of dinosaurs like sauropods and ornithopods proliferated in Africa. Middle Jurassic strata are neither well represented nor well studied in Africa. 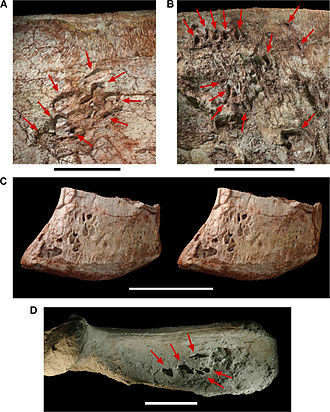 Late Jurassic strata are also poorly represented apart from the spectacular Tendaguru fauna in Tanzania. The Late Jurassic life of Tendaguru is very similar to that found in western North America's Morrison Formation. Jurassic limestones and marls (the Matmor Formation) in southern Israel. 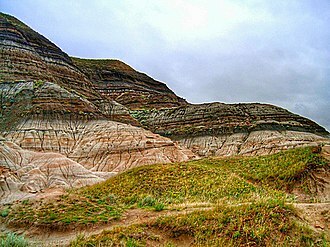 The late Jurassic Morrison Formation in Colorado is one of the most fertile sources of dinosaur fossils in North America. The Permian through Jurassic stratigraphy of the Colorado Plateau area of southeastern Utah. During the Jurassic period, the primary vertebrates living in the sea were fish and marine reptiles. 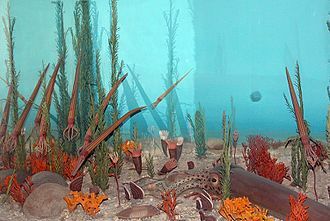 The latter include ichthyosaurs, which were at the peak of their diversity, plesiosaurs, pliosaurs, and marine crocodiles of the families Teleosauridae and Metriorhynchidae. Numerous turtles could be found in lakes and rivers. 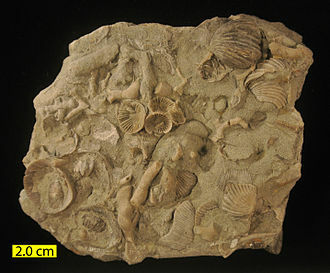 In the invertebrate world, several new groups appeared, including rudists (a reef-forming variety of bivalves) and belemnites. Calcareous sabellids (Glomerula) appeared in the Early Jurassic. 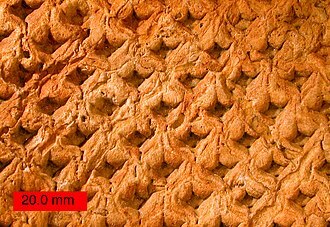 The Jurassic also had diverse encrusting and boring (sclerobiont) communities, and it saw a significant rise in the bioerosion of carbonate shells and hardgrounds. Especially common is the ichnogenus (trace fossil) Gastrochaenolites. 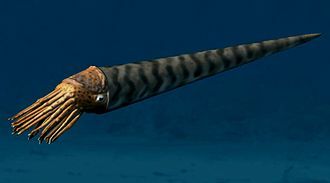 During the Jurassic period, about four or five of the twelve clades of planktonic organisms that exist in the fossil record either experienced a massive evolutionary radiation or appeared for the first time. A Pliosaurus (right) harassing a Leedsichthys in a Jurassic sea. 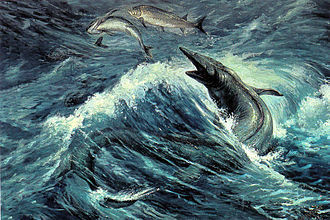 Ichthyosaurus from lower (early) Jurassic slates in southern Germany featured a dolphin-like body shape. Plesiosaurs like Muraenosaurus roamed Jurassic oceans. Gastropod and attached mytilid bivalves on a Jurassic limestone bedding plane in southern Israel. On land, various archosaurian reptiles remained dominant. The Jurassic was a golden age for the large herbivorous dinosaurs known as the sauropods—Camarasaurus, Apatosaurus, Diplodocus, Brachiosaurus, and many others—that roamed the land late in the period; their foraging grounds were either the prairies of ferns, palm-like cycads and bennettitales, or the higher coniferous growth, according to their adaptations. The smaller Ornithischian herbivore dinosaurs, like stegosaurs and small ornithopods were less predominant, but played important roles. They were preyed upon by large theropods, such as Ceratosaurus, Megalosaurus, Torvosaurus and Allosaurus. All these belong to the 'lizard hipped' or saurischian branch of the dinosaurs. 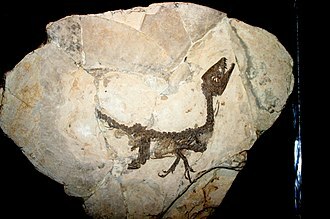 During the Late Jurassic, the first avialans, like Archaeopteryx, evolved from small coelurosaurian dinosaurs. In the air, pterosaurs were common; they ruled the skies, filling many ecological roles now taken by birds, and may have already produced some of the largest flying animals of all time. Within the undergrowth were various types of early mammals, as well as tritylodonts, lizard-like sphenodonts, and early lissamphibians. The rest of the Lissamphibia evolved in this period, introducing the first salamanders and caecilians. Diplodocus, reaching lengths over 30 m, was a common sauropod during the late Jurassic. Allosaurus was one of the largest land predators during the Jurassic. Stegosaurus is one of the most recognizable genera of dinosaurs and lived during the mid to late Jurassic. 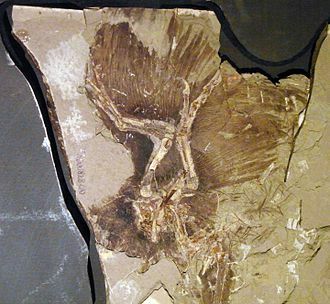 Archaeopteryx, a primitive bird-like dinosaur, appeared in the Late Jurassic. 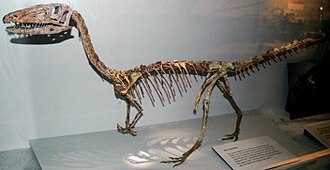 Aurornis xui, which lived in the late Jurassic, may be the most primitive avialan dinosaur known to date, and is one of the earliest avialans found to date. 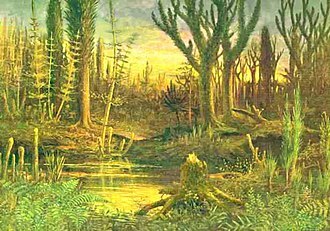 The arid, continental conditions characteristic of the Triassic steadily eased during the Jurassic period, especially at higher latitudes; the warm, humid climate allowed lush jungles to cover much of the landscape. Gymnosperms were relatively diverse during the Jurassic period. The Conifers in particular dominated the flora, as during the Triassic; they were the most diverse group and constituted the majority of large trees. 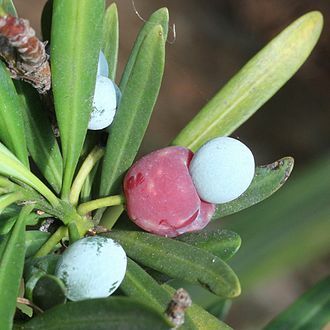 Extant conifer families that flourished during the Jurassic included the Araucariaceae, Cephalotaxaceae, Pinaceae, Podocarpaceae, Taxaceae and Taxodiaceae. The extinct Mesozoic conifer family Cheirolepidiaceae dominated low latitude vegetation, as did the shrubby Bennettitales. Cycads, similar to palm trees, were also common, as were ginkgos and Dicksoniaceous tree ferns in the forest. Smaller ferns were probably the dominant undergrowth. Caytoniaceous seed ferns were another group of important plants during this time and are thought to have been shrub to small-tree sized. Ginkgo plants were particularly common in the mid- to high northern latitudes. In the Southern Hemisphere, podocarps were especially successful, while Ginkgos and Czekanowskiales were rare. In the oceans, modern coralline algae appeared for the first time. However, they were a part of another major extinction that happened within the next major time period. ^ A 140 Ma age for the Jurassic-Cretaceous instead of the usually accepted 145 Ma was proposed in 2014 based on a stratigraphic study of Vaca Muerta Formation in Neuquén Basin, Argentina. Víctor Ramos, one of the authors of the study proposing the 140 Ma boundary age, sees the study as a "first step" toward formally changing the age in the International Union of Geological Sciences. ^ Hallam, A. (1986). "The Pliensbachian and Tithonian extinction events". Nature. 319 (6056): 765–768. Bibcode:1986Natur.319..765H. doi:10.1038/319765a0. Retrieved 2018-07-02. ^ a b Hölder, H. 1964. Jura – Handbuch der stratigraphischen Geologie, IV. Enke-Verlag, Stuttgart. ^ a b Arkell, W.J. 1956. Jurassic Geology of the World. Oliver & Boyd, Edinburgh und London. ^ a b Pieńkowski, G.; Schudack, M.E. ; Bosák, P.; Enay, R.; Feldman-Olszewska, A.; Golonka, J.; Gutowski, J.; Herngreen, G.F.W. ; Jordan, P.; Krobicki, M.; Lathuiliere, B.; Leinfelder, R.R. ; Michalík, J.; Mönnig, E.; Noe-Nygaard, N.; Pálfy, J.; Pint, A.; Rasser, M.W. ; Reisdorf, A.G.; Schmid, D.U. ; Schweigert, G.; Surlyk, F.; Wetzel, A. & Theo E. Wong, T.E. 2008. "Jurassic". In: McCann, T. (ed. ): The Geology of Central Europe. Volume 2: Mesozoic and Cenozoic, Geological Society, London, pp. 823–922. ^ Rollier, L. 1903. Das Schweizerische Juragebirge (Sonderabdruck aus dem Geographischen Lexikon der Schweiz). Verlag von Gebr. Attinger, Neuenburg. ^ a b c d e f Kazlev, M. Alan (2002). "Palaeos website". Archived from the original on 2006-01-05. Retrieved July 22, 2008. ^ "Jurassic Period". Archived from the original on 2007-07-14. ^ "map". Archived from the original on 2007-07-15. ^ a b c d e Jacobs, Louis, L. (1997). "African Dinosaurs". Encyclopedia of Dinosaurs. Edited by Phillip J. Currie and Kevin Padian. Academic Press. p. 2-4. ^ Vinn, O.; ten Hove, H.A. ; Mutvei, H. (2008). "On the tube ultrastructure and origin of calcification in sabellids (Annelida, Polychaeta)". 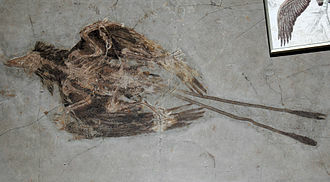 Palaeontology. 51 (2): 295–301. doi:10.1111/j.1475-4983.2008.00763.x. Retrieved 2014-06-11. ^ Taylor, P. D.; Wilson, M. A. (2003). "Palaeoecology and evolution of marine hard substrate communities". Earth-Science Reviews. 62 (1–2): 1–103. Bibcode:2003ESRv...62....1T. doi:10.1016/S0012-8252(02)00131-9. ^ Haines, Tim (2000). Walking with Dinosaurs: A Natural History. New York: Dorling Kindersley. ISBN 978-0-7894-5187-3. ^ Feduccia, A. (1996). 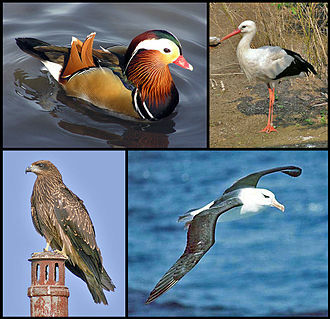 The Origin and Evolution of Birds. New Haven: Yale University Press. ISBN 978-0-300-06460-5. ^ Witton, Mark P.; Martill, David M.; Loveridge, Robert F. (2010). "Clipping the Wings of Giant Pterosaurs: Comments on Wingspan Estimations and Diversity". 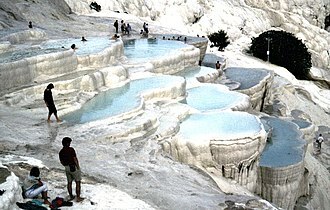 Acta Geoscientica Sinica. 31 (Supp 1): 79–81. ^ Carroll, R. L. (1988). Vertebrate Paleontology and Evolution. New York: WH Freeman. ISBN 978-0-7167-1822-2. ^ a b Haines, 2000. ^ Behrensmeyer et al., 1992, 349. Behrensmeyer, Damuth, J.D., DiMichele, W.A., Potts, R., Sues, H.D. & Wing, S.L. (eds.) (1992), Terrestrial Ecosystems through Time: the Evolutionary Paleoecology of Terrestrial Plants and Animals, University of Chicago Press, Chicago and London, ISBN 0-226-04154-9 (cloth), ISBN 0-226-04155-7 (paper). Stanley, S.M. ; Hardie, L.A. (1998). "Secular oscillations in the carbonate mineralogy of reef-building and sediment-producing organisms driven by tectonically forced shifts in seawater chemistry". Palaeogeography, Palaeoclimatology, Palaeoecology. 144 (1–2): 3–19. Bibcode:1998PPP...144....3S. doi:10.1016/s0031-0182(98)00109-6. Stanley, S.M. ; Hardie, L.A. (1999). "Hypercalcification; paleontology links plate tectonics and geochemistry to sedimentology". GSA Today. 9: 1–7. Taylor, P.D. ; Wilson, M.A. (2003). "Palaeoecology and evolution of marine hard substrate communities" (PDF). Earth-Science Reviews. 62 (1): 1–103. Bibcode:2003ESRv...62....1T. doi:10.1016/s0012-8252(02)00131-9. Archived from the original (PDF) on 2009-03-25. 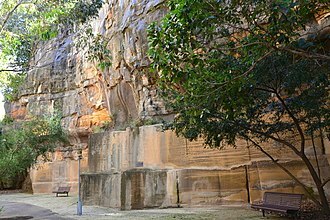 Wikimedia Commons has media related to Jurassic. Look up jurassic in Wiktionary, the free dictionary. The Early Jurassic epoch is the earliest of three epochs of the Jurassic period. The Early Jurassic starts immediately after the Triassic-Jurassic extinction event,201.3 Ma, certain rocks of marine origin of this age in Europe are called Lias and that name was used for the period, as well, in 19th century geology. In southern Germany rocks of this age are called Black Jurassic, there are extensive Liassic outcrops around the coast of the United Kingdom, in particular in Glamorgan, North Yorkshire and Dorset. The Jurassic Coast of Dorset is often associated with the work of Mary Anning of Lyme Regis. The facies of the Lower Jurassic in this area are predominantly of clays, thin limestones and siltstones, Lias Group strata form imposing cliffs on the Vale of Glamorgan coast, in southern Wales. There has been debate over the actual base of the Hettangian stage. If this biostratigraphical indicator is used, technically the Lias Group—a lithostratigraphical division—spans the Jurassic / Triassic boundary, during this period, which had almost died out at the end-of-Triassic extinction, radiated out into a huge diversity of new forms with complex suture patterns. Ammonites evolved so rapidly, and their shells are so often preserved, there were several distinct waves of ammonite evolution in Europe alone. The Early Jurassic was an important time in the evolution of the marine reptiles, all these plesiosaurs had medium-sized necks and large heads. 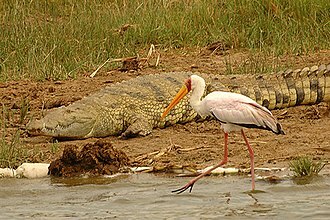 In the Toarcian, at the end of the Early Jurassic, accompanying them as small carnivores were the sphenosuchian and protosuchid crocodilians. 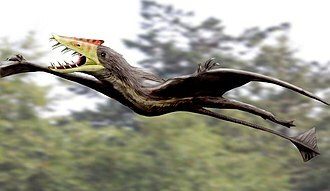 In the air, new types of pterosaurs replaced those that had died out at the end of the Triassic, but in the undergrowth were various types of early mammals, as well as tritylodont mammal-like reptiles, lizard-like sphenodonts, and early Lissamphibians. Late Triassic Toarcian turnover Davies, A. M, an Introduction to Palaeontology, Thomas Murby & Co. Geology of The Dorset Coast, The Geologists Association, simms, M. J. Chidlaw, N. Morton, N. and Page, K. N. British Lower Jurassic Stratigraphy, Geological Conservation Review Series, No,30, Joint Nature Conservation Committee, Peterborough. An extinction event is a widespread and rapid decrease in the biodiversity on Earth. Such an event is identified by a change in the diversity. It occurs when the rate of extinction increases with respect to the rate of speciation, Extinction occurs at an uneven rate. Based on the record, the background rate of extinctions on Earth is about two to five taxonomic families of marine animals every million years. Marine fossils are used to measure extinction rates because of their superior fossil record. The Great Oxygenation Event was probably the first major extinction event, since the Cambrian explosion five further major mass extinctions have significantly exceeded the background extinction rate. In addition to the five mass extinctions, there are numerous minor ones as well. Mass extinctions seem to be a mainly Phanerozoic phenomenon, with extinction rates low before large complex organisms arose, estimates of the number of major mass extinctions in the last 540 million years range from as few as five to more than twenty. These differences stem from the chosen for describing an extinction event as major. 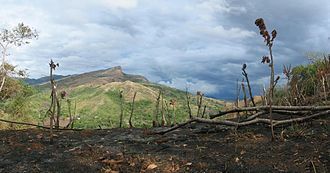 In a landmark paper published in 1982, Jack Sepkoski and David M. Raup identified five mass extinctions, the Big Five cannot be so clearly defined, but rather appear to represent the largest of a relatively smooth continuum of extinction events. Cretaceous–Paleogene extinction event,66 Ma at the Cretaceous -Paleogene transition interval, the event formerly called the Cretaceous-Tertiary or K–T extinction or K-T boundary is now officially named the Cretaceous–Paleogene extinction event. About 17% of all families, 50% of all genera and 75% of all species became extinct, in the seas all the ammonites and mosasaurs disappeared and the percentage of sessile animals was reduced to about 33%. All non-avian dinosaurs became extinct during that time, the boundary event was severe with a significant amount of variability in the rate of extinction between and among different clades. 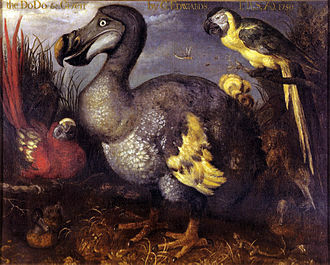 Mammals and birds, the latter descended from dinosaurs, emerged as dominant large land animals. In the geologic timescale, the Sinemurian is an age or stage in the Early or Lower Jurassic epoch or series. It spans the time between 199.3 ±2 Ma and 190.8 ±1.5 Ma, the Sinemurian is preceded by the Hettangian and is followed by the Pliensbachian. In Europe the Sinemurian age, together with the Hettangian age, saw the deposition of the lower Lias, the Sinemurian stage was defined and introduced into scientific literature by French palaeontologist Alcide dOrbigny in 1842. It takes its name from the French town of Semur-en-Auxois, near Dijon, the calcareous soil formed from the Jurassic limestone of the region is in part responsible for the character of the classic Sancerre wines. The base of the Sinemurian stage is at the first appearance of the ammonite genera Vermiceras and Metophioceras in the stratigraphic record. A global reference profile for the Sinemurian stage is located in a north of the hamlet of East Quantoxhead,6 kilometres east of Watchet, Somerset. 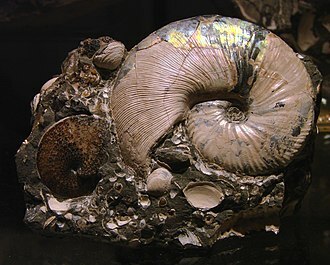 The top of the Sinemurian is at the first appearances of the ammonite species Bifericeras donovani,2001, Global Stratotype Section and Point for base of the Sinemurian Stage, Episodes 25, pp. In the geologic timescale, the Kimmeridgian is an age or stage in the Late or Upper Jurassic epoch or series. It spans the time between 157.3 ±1.0 Ma and 152.1 ±0.9 Ma, the Kimmeridgian follows the Oxfordian and precedes the Tithonian. The Kimmeridgian stage takes its name from the village of Kimmeridge on the Dorset coast, the name was introduced in literature by Swiss geologist Jules Thurmann in 1832. 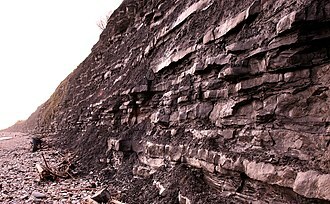 The Kimmeridge Clay Formation has its name from the type location. It is the source for about 95% of the petroleum in the North Sea, historically the term Kimmeridgian has been used in two different ways. The base of the interval is the same but the top was defined by British stratigraphers as the base of the Portlandian whereas in France the top was defined as the base of the Tithonian. The differences have not yet fully resolved, As of 2004 Tithonian is has been seen as the uppermost stage of the Jurassic in the timescale of the ICS. The base of the Kimmeridgian is at the first appearance of ammonite species Pictonia baylei in the stratigraphic column, a global reference profile for the base had in 2009 not yet been assigned. Cyclically alternating limestone (light, more competent) and marl/clay layers of Oxfordian age at Péry-Reuchenette, near Tavannes, Jura Mountains, Switzerland. Jurassic rock strata in the cliffs at East Quantoxhead, near the Sinemurian golden spike. 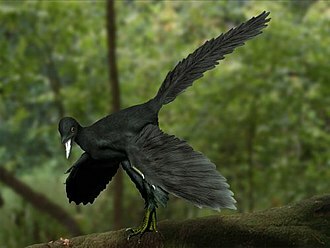 It is believed that the Port Waikato creature was similar to Compsognathus longipes, shown here. Massive cliffs in Zion Canyon consist of Lower Jurassic formations, including (from bottom to top): the Kayenta Formation and the massive Navajo Sandstone. Lias formations at Lyme Regis, UK, known locally as Blue Lias. 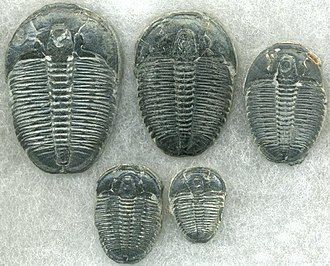 Trilobites were highly successful marine animals until the Permian–Triassic extinction event wiped them all out. Reptiles that live in the sea.